Put simply, the eyes of the world were be on Brazil in 2016. If you are looking for excitement on your next holiday, it should definitely rank very highly on your “potential destinations list”. If you’ve always had ambitions to go there, now is a great time! The Olympic and Paralympic Games were held in Brazil’s second largest city, Rio de Janeiro, in August and September respectively of 2016. As anyone who was lucky enough to be in Sydney in 2000 will agree, being in the host Olympic city while this global sporting extravaganza is taking place is an amazing experience, whether or not you actually attend any events. Brazil also offers plenty of other options for holiday-makers, from carnivals and culture to adventure and ecotourism. We’ve put the country through our Optimise Travel holiday destination test. Current exchange rates between the Australian dollar and the Brazilian real make Brazil a great value for money destination for Australian tourists, which is a bonus. As the graph below shows, this has been the case for the last few years in particular. The Australian dollar (AUD) will buy you approximately 2.64 Brazilian reals (BRL), a far cry from a decade ago when it hovered around the 1.5 real mark. 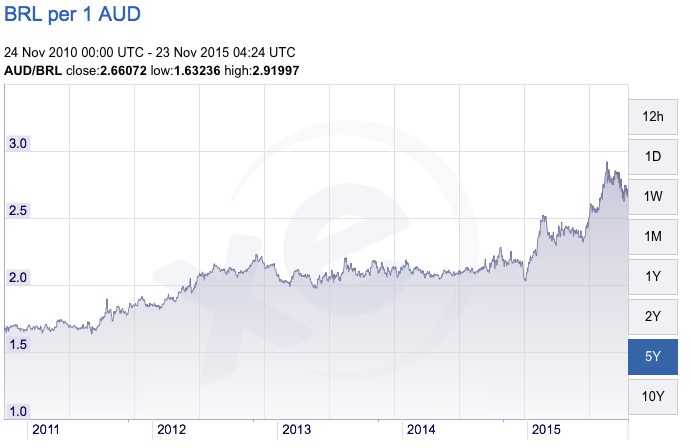 Even just 12 – 18 months ago, an Australian dollar would only get you just over 2 Brazilian reals. Before we get into those, you need to get your head around the geographic layout of the country. 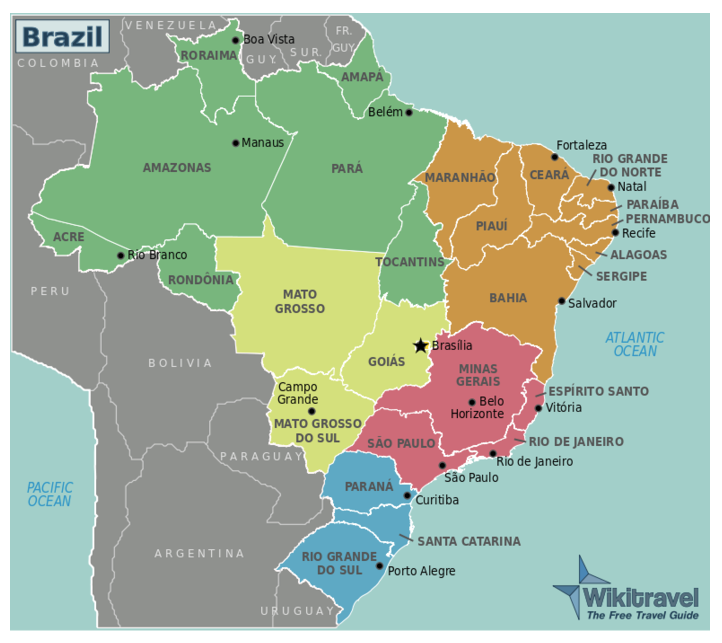 Brazil is made up of 26 states, and 5 regions (Northern, Northeast, Central-West, Southeast and Southern). These regions are colour-coded in the map below. It is bordered by 10 countries – Uruguay, Argentina, Paraguay, Bolivia, Peru, Columbia, Venezuela, Guyana, Suriname and French Guyana. While Portuguese is the official language of Brazil, learning a second language is compulsory in Brazilian primary and secondary schools, and English is a popular option. So while there will be a language barrier to some extent, it won’t be as severe as in some other parts of the world. This world famous 4-day festival is the largest of its kind in the world and is held before Lent each year. In 2019, it will be held from March 1st-9th. During this time, you can expect a party atmosphere with numerous street parades, floats and more than 2 million people a day flooding Rio’s streets, bars, cafes and other popular venues. The festival finishes with the spectacular Rio Samba Parade. The Copacabana beach stretches for more than 4 kilometres with its picturesque white sand and surf. The beach is bordered by a distinguishing promenade paved in a black and white mosaic style. The summit of this 710-metre high mountain offers unsurpassed panoramic views of the city. At the summit, you’ll also find the iconic 30 metre statue of Cristo Redentor (Christ the Redeemer). This statue is the second largest sculpture in the world and casts an imposing presence watching over the city. A train or taxi is the best way to reach the top of Corcavado. The Sugarloaf Cable Car is an alternative to Corcavado mountain in terms of gaining an aerial view of Rio de Janeiro. The cableway takes you to the summit of the 396-metre mountain. The Amazon River stretches for 6,400 kilometres and is the second longest in the world, accounting for about one-fifth of the world’s river flow. It is surrounded by half of the world’s remaining rainforest area. Boat tours are a great way to explore the unique Amazonian ecosystem, taking in the wonders of nature and providing the chance to see wildlife like monkeys, jaguars, anacondas, anteaters, otters, and toucans. The Pantanal is the world’s largest tropical wetland area, supporting a diverse range of plant and animal species. It has one of the largest jaguar populations in the world. The Iguaza Falls are located near the border of Brazil and Argentina. There are over 275 waterfalls, the largest being Devil’s Throat, which is U-shaped and has a height of 82 metres. There is a long walkway along the canyon where tourists can take in the breathtaking views. Also known as “the Brazilian Maldives”, at Jericoacoara you’ll be able to swim in the freshwater lagoons, with its deep blue and green water, and relax afterward in a hammock drinking a cold beverage. You can also watch the sunrise over the ocean, which is a magical experience at this beautiful location. If you’re looking for something a bit off the beaten track, Fernando de Noronha is a World Heritage listed collection of 21 islands, approximately 350 kilometres off the coast of Brazil. The only way you can get there is via a two-day cruise or by booking a seat on a chartered plane. When you arrive, you need to pay a small environmental preservation fee, and you’ll understand why when you get there. It is one of the best dive sites in the world, with incredible visibility in its clear waters. In August and September, Brazil can be slightly more expensive and crowded. Brazil successfully hosted the 2014 FIFA World Cup, and 2016 Olympics and will have learnt a lot from dealing with the massive influx of tourists from all over the world. Local school holiday dates in Brazil aren’t as fixed as they are in many other countries, it is up to individual schools to decide. However, with Christianity being the dominant religion in the country, you can expect Easter and Christmas periods to be school holiday times, with holiday destinations and accommodation within Brazil being more crowded and expensive accordingly. In terms of seasons, Brazil’s occur at the same time as Australia’s, since both countries are in the southern hemisphere. Its climate is similar to Australia’s, with various areas ranging from desert to tropical, and temperatures varying across the country. In the southern regions of the country it gets cooler in winter, but in other parts of the country temperatures are more even throughout the year. Brazil only has moderate rainfall throughout the year, with most occurring in the summer months. There are regular flights to both Sao Paulo and Rio de Janeiro (the two largest cities in Brazil) from most capital cities in Australia. It’s a long flight, taking between 29 and 31 hours from the east coast of Australia, based on one quick stopover at a connecting flight destination along the way (such as in Singapore or Dubai). Connecting flights are common for such a long journey. Your total travel time will obviously be affected by the length of any stopovers, so you should plan accordingly. Within Brazil, there are airports in the major cities of each of its 26 states. Flights between states are relatively short by Australian standards. For example, a flight between the two largest cities of Sao Paulo and Rio de Janeiro takes about 45 minutes. A long flight would be from Rio Grande do Sul in the deep south of the country to Roraima in the far north, which takes approximately 4 and a half hours. The Australian government’s official advice from the Department of Foreign Affairs and Trade is that Australians should exercise a high degree of caution when travelling in Brazil. This is because there is a relatively high level of serious crime in the major cities of the country. This means you should take sensible precautions, like paying close attention to your personal security and belongings at all times. You should also be aware that there is a relatively high level of HIV/AIDS within Brazil, and you should take precautions if engaging in any activities that will expose you to the risk of infection. In addition, Sao Paulo is currently experiencing a severe drought and has imposed water restrictions and rationing. The quality of available water has also been affected, with people in the city being advised to boil water for sanitation accordingly. As with travelling to any destination, you should talk to your doctor about appropriate vaccines and preventative medicines before you go. In addition to the routine vaccines, for Brazil you should prevent your chances of contracting any of the following diseases –hepatitis A/B, typhoid, yellow fever and malaria. Please Share your Brazilian tips, tricks and stories in the comments section so that others can benefit on their travels!